In my previous blog about Karl Germain I mentioned that the poster of him with the spirit figure/witch and black cat was one of the most striking posters in all of magic history. (Part of that poster can be seen to the right) Though I had seen the poster image in my youth, it would be a number of years before I actually encountered his magic. This happened through two books The Secrets of Karl Germain & Germain the Wizard and His Legerdemain by Stuart Cramer that I happened to eventually track down. I found Germain the Wizard and his Legerdemain at Barry's Magic Shop and some time later I found Secrets of Karl Germain at Denny & Lee's Magic Shop. I was so thrilled because I'd always heard of the books, but they were long out of print. Yet, when I found copies I made sure to buy them and devour the contents. One of the book contains a most unusual magic effect called The Block. The routine begins with Germain passing out a long block of wood to an audience member to examine. He also has a wooden board that he passes out for examination. After they are returned he brings them on stage and holds the end of the block against the board and it passes right through. Quickly, Germain removes it and places that block against a different area on the board and it again passes right through. Finally, he picks a third spot and again does the seemingly impossible. If this thing looks as good as the photographs it must look like a miracle. One of the great benefits of much of Germain's magic is the naturalness and simplicity of the props. At least as far as how they appear to the audience. What could be simpler than a block of wood and a wooden board? There is a photograph of Germain and a butterfly that I always found quite magical. Well that routine, called simply The Butterfly and here is another effect that sounds like a dream. Germain plucks silk scarves out of thin air, one at a time. He bunches the scarves together to form a sort of cocoon and suddenly the thing bursts open to reveal a very large silken butterfly spreading it's wings! I wish I could see this in action. The photos of the butterfly are amazing and I've only seen them in black and white. I can only imagine what they look like in color or in real life. A popular magic effect today is taking several colored scarves and turning them into a giant silk with a butterfly printed on it. But Germain's effect is so beyond that. Germain's Water Jars is an effect that I've heard about but never really knew all the details. It's been said about this effect that Germain was the only performer to ever really make it work. By that I imagine others had tried but never gained the notoriety from the effect like Germain did. 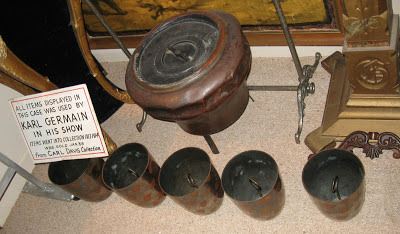 Here is a description of The Germain Water Jars...Six Large Metal Jars are shown to be empty one at a time. Then mysteriously, each jar fills to the brim with water which is then poured out into a large tub. It sounds amazing. I've never seen it performed. I do know that David Ben had performed a version of it in his show The Conjurer, ten years or so ago. But I can tell from the description that most modern performers would avoid this effect for the simple reason that it's liquid and thus messy. But if other magicians from Germain's time tried to perform it and met with little success, then I'd have to say it belongs only in the hands of a master conjurer. The idea of growing flowers was not a new thing in magic. Robert-Houdin was doing it long before Germain and then his flowers turned into Oranges! But most magicians were using some sort of covering or tube during the course of their flower routines. Harry Kellar used covers and had an incredible sequence of misdirection to bring about the conclusion of his trick. 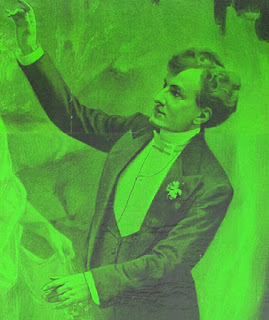 Karl Germain's father had seen a magician in Europe in the 1860s present some sort of Blooming Flower routine and it left such an impression, it's no surprise that a version of it found it's way into Karl's act. Together, father and son created a number of different versions of the Growing Flower trick, but the final version was pure magic. It was called The Enchanting Rose Wonder. No coverings in this version. It began with a flower pot sitting on a three legged table. The pot was filled with soil and slowly little sprouts appeared, then more foliage and eventually the roses. 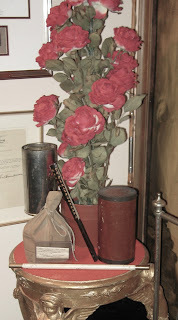 And in Germain's version, the roses were clipped off and given to members of the audience thus proving they were real! To the left is a photo of the actual Germain Flower Growth now in the collection of Ken Klosterman. You can actually see a video of the Flower Growth in action on the DVD set for the 2011 Essential Magic Conference. During the tour of David Copperfield's collection, he actually stops and demonstrates the trick. Many of my magician friends ask me "what's the big deal about magic history?". There are so many ways to answer that, but the above piece on Germain's magic just shows how inspirational a look back can be. Who today is turning silks scarves into a butterfly? And with the technology today imagine how much more incredible we could make it look. Jim Steinmeyer, one of magic's most prolific writers and inventors was inspired by Germain's Block trick when he created The Perforated Brick effect which can be found in his book Conjuring Anthology. If Mr. Steinmeyer get's inspiration from Germain, I think we all could! These are just a few of the wonders from Karl Germain's show. I may put together a second article featuring more of Germain's effects. I'm also working on another biographical article. In the mean time, if you're interest in Germain is peaked in the same way mine was, you might want to track down the book Germain the Wizard by Stuart Cramer and published by The Miracle Factory. The book has been sold out for some time, but you might be able to find a copy at Denny's or on eBay. Until next time! I missed the previous post with the picture of the poster. Just went back to look at it. It really does have everything! Amazing detail. It may be my favorite magic poster of all time. The one thing I wonder about though is what the original color of the poster was....OR did he have several different versions made. I've seen this in a bright orange, I've seen it in yellow. But Germain was known for his 'red/black' color scheme so I can't help but wonder if perhaps the originals were red and black and the color faded over time. Or maybe some were orange and other yellow just to be different.